Now that's a positive statement to close out the year. Wishful thinking? Perhaps say those bent on an ounce of Gold ($1,212.90) being valued at no more than an ounce of Tungsten ($1.34), if not outright Zero ($0). We however are already seeing a fresh glint upon the yellow metal's surface now, just a week's time after having put forth a technically negative stance that implied Gold would re-test the year's low (1179), trading down to 1162 by the end of 2013. Through the twists and turns of the technicals, 'twas one week ago we opened this missive by pointing out that the MACD (moving average convergence divergence) study on Gold's daily bars had crossed negatively, the Market Rhythm therein showing a high probability (90%) of price falling, as noted, to 1162. To be sure, the bane of technical analysis is its resorting to "whip-sawing" on occasion, (which is why we run 224 Market Rhythm studies every trading day in search of those having exhibited the best follow-through by price). As of this writing, we're happy (in that we don't condone shorting Gold) that the MACD negative crossing did not further pan out: per yesterday's (Friday's) close, the study has moved on to confirmed a positive crossing. Two points to note from this: 1) the MACD's whip-saw is indicative of sellers' lacking commitment to drive price lower; and 2) unless we've an ongoing whip-saw, this positive crossing suggests an 80% probability of Gold trading up to at least 1240 prior to the next negative cross. We emphasize the above results are merely an observation of what's already occurred and that the ensuing outcomes can be a series of failures, so you are on your own out there. Yet just as the trend is our friend in determining the further price direction of a market, 'tis helpful as well to try to discern its repetitive rhythmic tendencies: for in the world of trading, getting direction correct is secondary to prudent cash management. Now let's segue with Gold into further justification for a stock market crash. When it comes to markets, the word "crash" ought not be bandied about lightly -- which too often 'tis, even in describing what is really only a abrupt correction. A "crash" is not just markets-disruptive, but monetarily and fiscally damaging to both institutions and individuals 'round the world. The last thing I think of myself as is a fear-mongeror, a whole host of whom one can readily encounter throughout the Internet and other media sources. But as a quant-luvin' numbers cruncher, too often these days I put 2 + 2 together and end up with ½ rather than 4. Regular readers know my peevishness over the "if properly calculated" price/earnings ratio of the S&P 500, (which capitalization-weighted is 65.2x right now; or instead if simply ascribing the stock price to those companies earning less than $1/share, the p/e reduces to 21.1x -- the latter method being cheating in order to come in with a more "acceptable" ratio). But let's go beyond the once-honoured, now dumbed-down p/e measure. "Complacency" comes to mind. Oh how rife the stock market is with complacency! At holiday gatherings I've found myself in friendly conversation with hard-working folks who've nary a qualm about the market. "The market's great!" they happily say, "It keeps going up and the economy's growing!" 'Tis as if they've returned to contently splashing about in the liquid of the womb. "Yeah, the start of ObamaCare was a problem, but healthcare schmelshcare. He's president for three more years so he'll work it out. Oh that cheese is divine! Ummm! And did you try the Chardonnay?" Whilst the construction of the Econ Baro is correct, 'tis subject to the reliability of its data inputs. Consider the following: what if the vaunted monthly Non-Farm Payrolls report was changed to the Non-Farm Jobs report? "What's in a name, mmb? There's no difference..."
Oh, indeed there is a difference, Squire. For years Jane Doe had worked her 40-hours/week job at the factory. Jane's boss, in order to no longer have to subsidize her healthcare insurance expense, then cut her to 20-hours/week whilst simultaneously hiring John Doe to do the other 20-hours/week. Thus: there's still only the one job; but now 'tis accomplished by two payrolls. That's an Econ Baro positive, given that 'tis the number "payrolls" that are reported rather than the number of "jobs". And from the market's standpoint, a 401k for John has been created thus increasing the demand for stock. This further introduces the notion that traditionally "acceptable" price/earnings ratios have become obsolete: there simply is far greater demand upon an essentially fixed number of shares outstanding than there used to be. Thus the market continues to rise. Here we've the percentage of companies having bettered their year-over-year quarterly earnings versus those that have not for each of the last four Earnings Seasons. On average, there is only an 8% difference between "bettered" and "non-bettered" ... and yet the stock market is up 30%??? No wonder our calculated price/earnings ratios are so high! ...to where shall we go when we've run out of dough? To liquidate stocks, falling like dominoes. And quickly to sell lest price get too low! Fortunately for us in the know, we abide by our stance and position in Gold. Given the above reasons in toto is why I see a "crash" coming. For 2 + 2 cannot = ½ in perpetuity. 'Tis like the juggler's maintaining five balls in the air ... 'til the arms tire, the balls then falling in foundationless despair. I am optimistic for Gold as we to turn 2014. Gold had been marvelously and rightly correlated to the debasing course of quantitative easing both StateSide and abroad. 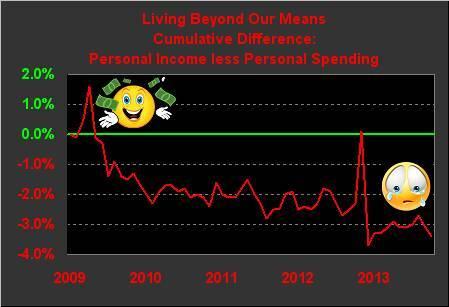 Price then got ahead of itself in 2011 only to now be quite honestly ridiculously behind itself, especially given QE continuing at an unconscionable rate. Some say that Gold is an "uncorrelated asset". Again, broad-based analysis across a decade of debasement refutes that notion. I remain firm that ever-increasing fiat-decreed money supplies can only redound positively for Gold. The first 5,000 years of Gold rising on balance was not an aberration; these two years of downtrend have so been. Yet, 'tis said that Gold has not seen a capitulative selloff. I think we saw several bouts of capitulative selling when many were not paying attention: we wrote this year of the "poltergeists" coming during the Spring and Summer nights, pounding down price by dozens of points per minute. And yet as noted at the outset, there was that negative MACD crossover that failed to produce any material downside movement. 'Tis time to turn the Gold leaf as we head into 2014. I opine that 'twould be extremely wise to lighten up in the equities markets and get some Gold in one's pockets. 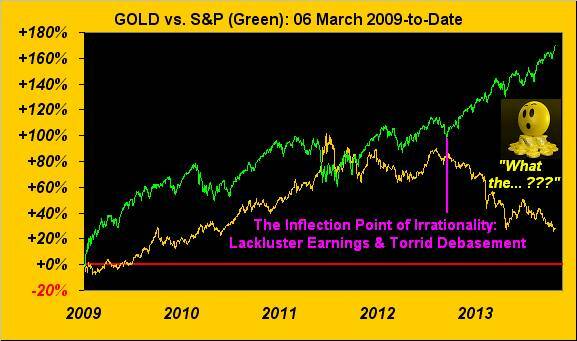 The chart herein showing those percentage tracks of Gold and the S&P since 2009 is beyond overdue to therein change trends. As 'tis said in France: "Soyez sages!" Best of the New Year to Everyone ... Stay safe and we'll see you on the other side.